Industry Partners join with Windustry to present Wind Energy Center! Industry Partners join with Windustry in a whirlwind of information, windspiration, and interactive fun at the Wind Energy Center! 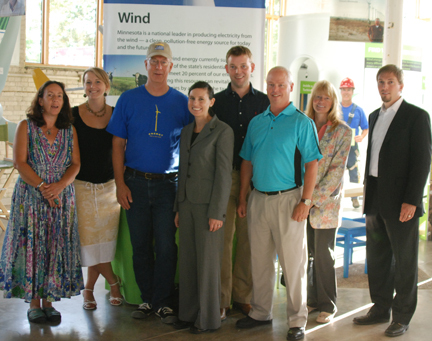 A record-setting 19 wind energy businesses and nonprofits stepped up to partner with Windustry to present the Wind Energy Center within The Eco Experience at the Minnesota State Fair this year. Windustry has presented at The Eco Experience since it was begun in 2006 by the Minnesota Pollution Control Agency to inspire people to lead more sustainable lives and improve their quality of life and the environment. 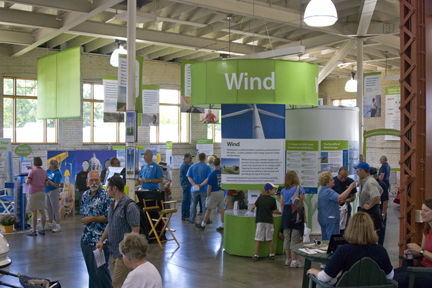 Visitors can explore wind turbines, consult computer mapping for wind speeds throughout the State and talk to staff and volunteers about the benefits of wind as a natural resource for renewable energy and economic development for rural communities. More than 350,000 visitors explored the Eco Experience in 2009 and a larger crowd is expected this year. The Minnesota State Fair runs August 26-September 6, 2010. The Eco Experience is located in the Progress Center building (J-9 on map) at the corner of Cooper Street and Randall Avenue on the State Fairgrounds. Read More on the Windustry website. Wind Energy Center Partners from Wind on the Wires, Thomsen Nybeck, P.A, AMEC and Windustry staff enjoy the Eco Experience Grand Opening. Windustry is pleased to announce that REGISTRATION is open for the Community Wind Across America two day conferences in the Rocky Mountain (10/26), Midwestern (11/15), and Mid Atlantic (11/30) regions. These conferences promise practical information on how to advance opportunities for locally-owned clean energy production and rural economic development through Community Wind and Small Wind development. What is Community Wind Across America? Community Wind Across America is a series of regional conferences on Community Wind and Small Wind, presented by Windustry with support from the U.S. Department of Energy. All who are interested in developing Wind Energy, including farmers, ranchers, rural landowners, economic development professionals, elected officials, business leaders, tribal representatives, investors, bankers, town planners, and community leaders. Hear from wind experts knowledgeable on wind development in the Region, and those who have developed community and small wind projects. Meet potential business colleagues and project financiers. Community wind energy projects come in many shapes and sizes, all sharing significant elements of local ownership and participation (public or private). This new economic opportunity for rural communities can build support for renewable energy in general while maximizing the local economic benefits of wind energy development. Small Wind turbines have rated capacities of 100 kilowatts and less. They produce clean, emissions-free power for individual homes, farms, and small businesses. The U.S. leads the world in the production of small wind turbines and the market is expected to continue strong growth through the next decade. This song by Johnny Mercer, with music by Henry Mayer, made the national charts when it was recorded by Wayne Newton in 1965. But it is most known for a 1966 recording by Frank Sinatra. Executive Director Lisa Daniels spoke at the National Women's Leadership Summit in June, joining oil industry officials, conservationists, and national business leaders. The three-day bipartisan gathering discussed national energy and environmental issues.The honorary co-chairwomen are U.S. Sens. Lisa Murkowski, R-Alaska, and Maria Cantwell, D-Wash.
We sponsored and attended the AREDAY environmental conference in Aspen Colorado, (America Renewable Energy Day), August 19-22, where a number of leaders in the financial and environmental sectors examined issues around renewable energy technology, renewable energy finance, the politics of climate change, and other climate change issues, including T. Boone Pickens, Gov. Bill Ritter, Ted Turner, and James Cameron. We attended the REAMP Annual Meeting at Loyola University of Chicago, August 3-4, joining other members to review accomplishments to date, network, and refine our regional strategy for the coming year. RE-AMP is an engaged and active network of nonprofits and foundations working on climate change and energy policy in an eight-state region of the upper Midwest.